Extreme medical assistant? Urban taxi? 21st Century mini AT-AT? It’s all there in the Hyundai Elevant concept vehicle that blends typical cruising modes with legs that can turn the vehicle into an all-terrain walker when the going gets tough. Described as a ‘modular EV platform’, the idea is to separate the core drive functions in the base from a swappable body design to suit any given scenario. When the legs are collapsed away for standard drive mode the power requirements are also reduced by cutting unnecessary power to those limb extensions. I also love the idea the walking style can operate as either ‘mammalian or reptilian’ to further refine its suitability to different environmental conditions. And in a nod to its parkour like flexibility, it can handle five-foot gaps, five-foot walls, or widen its foot width to 15-feet to deal with tricky situations. Kudos to the promo art. 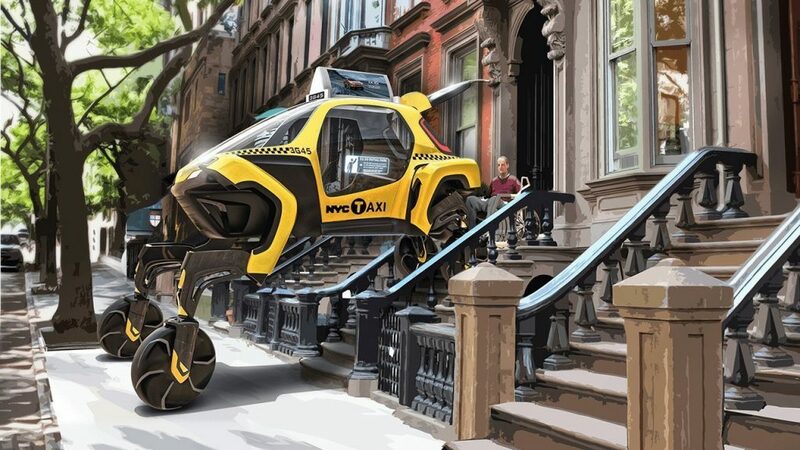 Showing us everything from rescue scenarios with fancy medical livery right through to a NYC taxi skin that can pick up a wheelchair passenger from the top of a New York brownstone staircase is a nice degree of versatility. Hyundai says this concept has been in development for three years with Detroit design studio Sundberg-Ferar and, of course, we have zero idea of when this concept would ever actually hit the market.